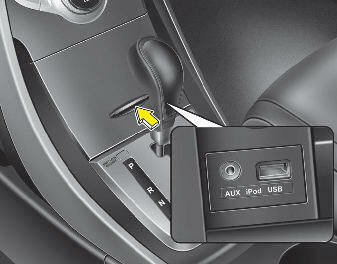 If your vehicle has an aux and/or USB(universal serial bus) port or iPod port, you can use an aux port to connect audio devices and a USB port to plug in a USB, or use the HYUNDAI accessory ipod cable the plugs into both ports to connect an ipod. When using a portable audio device connected to the power outlet, noise may occur during playback. If this happens, use the power source of the portable audio device. ❈ iPod® is a trademark of Apple Inc.